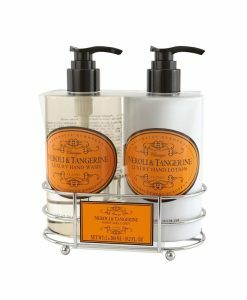 Our stylish hand care caddy includes the perfect combination, a luxury hand wash with a gorgeous hand lotion. This selection ensures your hands are clean, moisturised and truly cared for. Our products are made using hydrating ingredients and essential oils to bring luxury into your bathroom. The perfect gift for those who appreciate a little indulgence, or a welcome addition to brighten up your sink!